The name “Tex-Mex” is a combination of “Texas” and “Mexico.” It’s used to describe a cuisine which is an Americanized form of Mexican cooking — or more precisely, Mexican food, largely from northern Mexico as it has come to be made in Texas. Or, as some wags have put it, Mexican food for gringos. The term, and the food, conjure up images of the Wild West in people’s minds. It’s an inexpensive, simple-to-make, informal cuisine — a lot of it you even eat with your hands. Tortilla chips as a starter. As people’s taste buds have changed over the years, restaurants have been able to deliver tastes closer to actual Mexican. In Texas from the 1900s to about the 1960s, restaurants might have promised “authentic Mexican food” to get customers in, but the authenticity might have ended at the kitchen staff being Mexican. Out in the dining room, they were smart enough to serve the customers a version of Mexican that they would actually eat. Not only that, but they had to adopt recipes anyway to what ingredients they could actually source. Goat, for instance, was out, both on the basis of trying to find it anywhere, and trying to persuade people to eat it. Cornmeal in place of masa harina. The point that is often missed, however, is that Tex-Mex has now evolved into a fusion food all its own, not to be judged perhaps by either Mexican or American standards, but enjoyed in its own right. Mexican street food was available in Texas from the mid-1800s on. From 1907 to 1910, restrictive health laws drove most of the street vendors out of business, but Mexican restaurants sprang up instead. One of the earliest restaurants in Texas was called the “Original Mexican Restaurant”. It opened on Fannin Street in Houston in 1908. In the 1870s, a canned “chili con carne” product hit the market called “Montezuma Sauce”. It was chili with goat meat in it. It disappeared from the market in a short time, as no one would eat goat meat. When chili powder mix appeared on the market in 1894, that was a definite sign — some food writers now observe — that the “Tex” part was influencing the “Mex” part. The term “Tex Mex” has been around since at least the early 1880s, though it was applied to anything but food. — D.F.M. Letter from Aransas Wharf, St Josephs Island. Galveston, Texas. The Galveston News. 29 April 1882. Page 4. “Q. What are Tex-Mex?—B. R.
A. Texas-born Mexicans sometimes are known locally as Tex-Mex.” — “Answers to your Questions” column. Newark, Ohio. The Newark Advocate. 19 September 1928. Page 4. From the 1920s onwards, the term “Tex Mex” was used to apply to a lot of things — Tex-Mex Cement Company, Tex-Mex Institute, etc. By 1952, it was being used as the name of a brand of tomato purée, and for a variety of onion. Awareness of it as a separate cuisine worthy of promotion started in the early 1970s. The differences between it and Mexican food were outlined in “The Cuisines of Mexico” by Diana Kennedy in 1972. Before Diana, it was just thought of as Mexican food (in the same way that popular “Chinese” food in North America and in the UK is thought of as Chinese, even though it really isn’t). Some “Mexican” restaurants in Texas didn’t like the term at first; they took it as a slight, meaning “fake Mexican”. But outside of Texas, the term actually proved a marketing success. 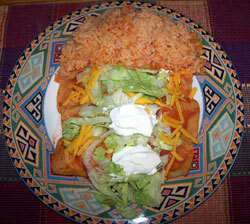 In the 1980s in Paris, France, Tex-Mex became a popular food trend. At which point in time, of course, they adopted the moniker with pride. In fact, Tex-Mex food has stayed popular in Paris. Possibly the first Tex-Mex restaurant in Paris was “The Studio”, opened in March 1983 by Claude Benayoun. Ingredients of the cuisine such as chili and tequila were popularized in the 1986 French film called “Betty Blue”. By the late 1980s, there were 12 Tex-Mex restaurants in Paris; by 1993, around 60. Seafood dishes and elements from Mexican cooking far below the northern part of Mexico. Now that Tex-Mex knows what it is, and is proud of it, it wants to have a cutting edge. Some wags have dubbed this new, evolving cuisine “Nuevo Tex-Mex”. There are some versions still of Tex-Mex restaurants that are “gringo friendly” — that you can take the folks from Canada or Scotland to, and know that they’ll be able to finish their meal. These restaurants are admittedly holdovers from the 1950s, but many people still like this level of Tex-Mex; it’s comfort food for them. Some argue that Tex-Mex is perhaps America’s oldest regional cuisine, and date it back to around 1851. That doesn’t seem to hold a candle, though, on the regional cooking that was already evolving in New England and in the American south Atlantic coast in the 1600s. Day after day the unblemished sun. It’s hot, but still, with a warm welcome, we save hot stuff for the enchilada dinner from down-on-the-border, straight from a Texas kitchen ready to reheat in the home frying pan with a loud ‘Yippy-i-ee.’ Three tins in the kit. First out, frijoles, the beans prepared with the pulp of red pepper. Next, a tin of enchilada sauce. It’s rich, it’s red, and it’s hot, hotter, hottest. Last, the big tin of tortillas, the flat corn cakes of Old Mexico, ready for frying, 2 dozen, and each paper-thin, 6 inches wide. Along with the trio of tins come directions for dinner. All you need add are a pair of onions and ½ pound of grated cheese. Get out a couple of skillets, and let’s fry tortillas one at a time in shallow, hot fat; they crisp in two seconds. The enchilada sauce is in skillet two and made hot as blazes. Lift the tortillas from hot fat to hot sauce, then out to a cookie sheet. Sprinkle with chopped onion and cheese. When all are fried, stacked, and ready, place and cookie sheetful into a slow oven and bring them forth piping. Serve with a fried or poached egg topping each portion and ladle on the leftover sauce. Serve the beans hot. Any extra tortillas pass as tostadas. Deep-fried, salted, they accompany the cocktails. The enchilada dinner is advertised as sufficient for six. We say nix, not if you like Mexican fare—then three may eat. The price is $1.90 for the 3-tin set. Order from Valley Canning Company, P. O. Box 31, El Paso, Texas.” — Paddleford, Clementine (1898 – 1967). Food Flashes Column. Gourmet Magazine. August 1948. Make tortillas by mixing cornmeal and salt, and adding enough spaghetti sauce for stiff dough. Add flour. Set dough aside for 20 minutes. Wet hands in water, mold dough into balls the size of eggs and pat down into thin cakes. Bake on lightly greased griddle, turning until brown on both sides. To spaghetti sauce, add pepper seed, onion and garlic. Bring to boil. Serve hot on tortillas, sprinkled with grated cheese. MRS. RICHARD SWIFT, 2305 41st Street. Galveston.” — from “Meats, Poultry and Seafood” column. Galveston, Texas: The Galveston News Tribune. 10 November 1957. Cookbook Section, Page 17. Walsh, Robb. A Six-Part History of Tex-Mex. Houston, Texas. Houston Press. 27 July 2000 – 21 Dec 2000. Smith, Andrew F. Tacos, Enchiladas and Refried Beans: The Invention of Mexican-American Food. Presented at Oregon State University at the “Cultural and Historical Aspects of Food” Symposium in Corvallis, Oregon. 9 to 11 April 1999.